In this game, a group of experimental players receive a defined seed capital, which they can invest covertly into a common stock (a container somewhere in the room) entirely or in parts. The examiner will double the invested amount and subsequently distribute it among all the participants equally. If for example four players received 10 Euros seed capital each, and everyone invested the whole 10 Euros, the examiner would find 40 Euros in the container. He would double the amount to 80 Euros, and disburse 20 Euros to each participant. If in contrast one participant invested only 6 Euros instead of 10 Euros, while the three others invested 10 Euros, there would be 36 Euros in the pot, so 72 Euros are distributed, giving a final amount of 18 Euros for the three players who invested 10 Euros. The player who only invested 6 Euros also receives 18 Euros from the pot, but still has 4 Euros from the seed capital left and now owns a final amount of 22 Euros. with \(\pi_i\) denoting the payoff of player \(i\), \(E\) denoting the initial endowment, \(I_i\) denoting the investment of Player \(i\), \(n\) the number of players, and \(f\) an enhancement factor by which the common pool is multiplied. From the point of view of a homo oeconomicus, it would be reasonable not to contribute anything to the common stock. A homo oeconomicus is an abstract economic (and game-theoretic) ideal type, who is considered rational, selfish and well informed. This homo oeconomicus will care about his own pay-off only. He will try to optimize it. No matter whether the other members of his community have disadvantages due to this behavior or co-players would gain a higher benefit from higher investment, this would not keep him from "free riding". Barry, Brian / Hardin, Russell (Eds.) (1982): Rational man and irrational society? Beverly Hills, CA. Sage. Usually, such individual advantages quickly serve as a role model in social dilemmas. When players are not allowed to communicate, after a few rounds, none of the players will invest anymore. Experiments with repeated public good games show that "not-investing" (defection) acts as an attractor, generating a so called Nash-equilibrium. In the Public goods game by contrast, non-investing is unpleasantly tenacious, since free riding is contagious. After a few iterations, nobody invests anymore, because players can see that the ones not investing (defectors) fare better than the investors (cooperators). Non-investing therefore marks a so called local minimum which, however, is sub-optimal in terms of the pay-off. If nobody invests, nobody gains from the common pool. 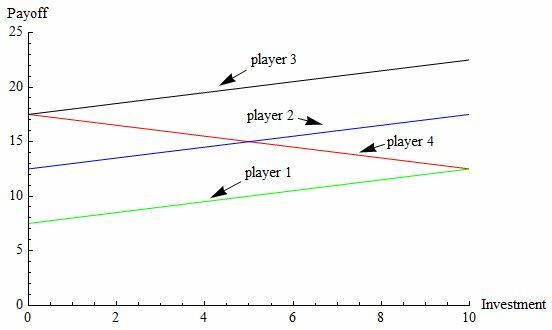 Game theoretic experiments with human probands repeatedly playing Public good games show that cooperation-probability usually declines significantly in the course of a couple of games. Fehr, Ernst / Gächter, Simon (2000): Cooperation and Punishment in Public Goods Experiments; in: American Economic Review 90, p. 980. However, when nobody invests, everyone has less than what could be gained if at least a few players invest or – as the optimal solution – all players invest all their capital. The latter therefore marks a so called global optimum. One can imagine the situation by looking at the behavior of a sphere that comes to rest on a wave-like surface: following the law of gravity, it will roll into the nearest valley. The surface of the Public goods game has two minima. On the one hand there is the local minimum, where nobody invests anything. Here, the sphere finds a so called meta-stable equilibrium. On the other hand, there is the global minimum, where everyone invests everything, representing an ultimate equilibrium (for this situation) to the sphere. 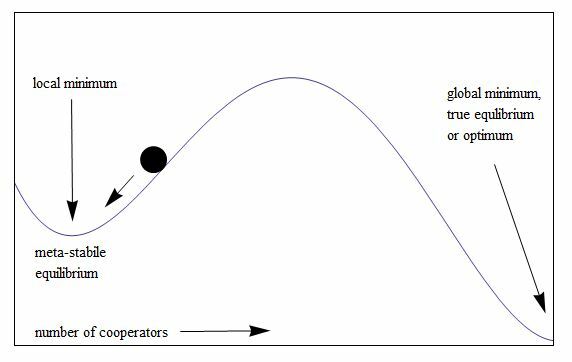 However, between this optimal global minimum and the sub-optimal local minimum there’s a steep mountain of highly improbable investment constellations. Note that each player's yield depends on the investment of the others.